A few weeks ago we told you the story of five female green turtles released from Alagadi (Alakati) beach in Cyprus to be tracked via satellite by researchers* aiming to identify foraging areas in the Mediterranean so far unknown. “To know is to do” so if we know where the rare green turtles feed we can then help protect these areas. Since their release on June 30th, we have been following the 5 turtles closely, wondering if they would reveal their secret. And bless them, they did! All 5 migrated through the Levantine sea, south of Cyprus, passed the waters of Lebanon, Israel and Gaza, and arrived at (drumsticks)….Bardawil lagoon in N. Sinai in Egypt! If that name sounds familiar it is because MEDASSET and our Egyptian colleagues surveyed Bardawil lagoon in 2012 following reports of numerous dead turtles there. Our survey indicated that Bardwil may be a feeding, development or overwintering habitat for sea turtles. But back then we could not say for sure how important this area is for the green turtles. The current project’s preliminary results prove the direct link between Alagadi (Alakati) beach in Cyprus and Egypt’s Bardawil lagoon, and amplify the importance of this Egyptian Ramsar site. Exciting times for all sea turtle research in the Mediterranean! “Science can help put the pieces of the puzzle together” says Phil Bradshaw, who is managing the north Cyprus research project for the Marine Turtle Research Group. We have encountered a complication however. Although tracking of Waddy and Sammanie continues, two of the sea turtles, Sim and Toby, have not transmitted during September and Frankie has not transmitted for over two weeks. This probably means that the tracking devices failed, perhaps because of the very high salinity of the lagoon’s water. Our 2012 survey of stranded sea turtles indicated that Bardawil may be a feeding area for turtles, but also a deadly trap. There were indications that fisheries were a likely cause of some of the turtle deaths in 2012. The scientists of the north Cyprus project in collaboration with MEDASSET will seek the turtles and investigate the new scientific conundrum. We are in touch with the manager of the Zaranik Protected Area (the eastern part of the lagoon) and the good news is that local fishermen report that they have not caught the turtles, which means they are probably still out there. To continue with this work and to link up other critical habitats of the green turtle we need your help! Visit www.seaturtle.org/tracking/?project_id=1107 to follow Waddy and Sammanie. If you would like to support this project, you may do so by adopting any of the sea turtles that were tracked to Lake Bardawil. This project would not be possible without SEATURTLE.ORG and its STAT tool: consider supporting their 2015 fund drive! 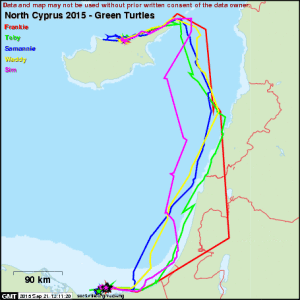 * North Cyprus 2015 – Green Turtles is carried out by the Marine Turtle Research Group in conjunction with Exeter University, MEDASSET, other partners and sponsors. "The Mediterranean Sea, a Source of Life"